Pirated or cracked android apps and Cracked android games pose a major threat to your phone and data . If you think by downloading these free cracked android apps and games, you’re saving you a lot of money . Then think again , Do you want to risk your personal data and files just for saving a few dollars ? Lets have a deeper look into the threat . Why you should not install Cracked Android Apps ? Many researches have revealed that most of the android malwares and viruses enter an Android phone through sideloading Android apps . Sideloading is an term for installing apps from other sources rather than the Google play store . 99 percent of malwares and virus have always come from apps outside the Google play store . You could be enjoying your new cracked android app or the latest cracked android game that you got for free . While the app will work perfectly normal , but in the background These cracked apps and games will be recording your each and every activity . Some malwares and viruses even have the capability to capture picture and videos from your phone’s camera . Something that most android users cannot even imagine . Lets take a look on some of the major viruses and vulnerabilities in the past few years . Recently an Android “Master key “ vulnerability was discovered which had the potential to compromise 99% of the android phones . Luckily the vulnerability was patched very soon . Hackers are always waiting advantages of these exploits and release new cracked apps to lure their victims . According to Bluebox security , Hackers have got their hands on a Android master key , which can allow a hacker to have access to any android phone and turn them into a “ Zombie” . A very serious threat that could have allowed hackers to collect any kind of data from your android phone and control them according to their will . All without the phone owners notice . Any potential hacker would take advantage of this vulnerability to repackage cracked android apps and games and games and steal your private data . Fakeinstaller was an such android malware that affected a lot of android devices . The Fakeinstaller malware used to disguise itself as an installer for a legitimate application . Once installed it used to send messages to premium rate numbers in the background . Fakeinstaller mostly originated from Cracked android apps and games on the internet . Andr/PJApps-C : This is one of the most found viruses in Repackaged or cracked android apps and games available on public sites . Andr/Opfake-C : This is a virus that fakes itself as an opera browser . It installs android malicious android packages and sends messages to Premium rate number . Andr/BatteryD-A : This is a fake battery doctor app claiming to extend your phone’s battery life . It mostly sends potentially identifiable information to a server using HTTP, and aggressively displays adverts. That will be a brief introduction to some of the most common and dangerous Virus , malwares and vulnerabilities . 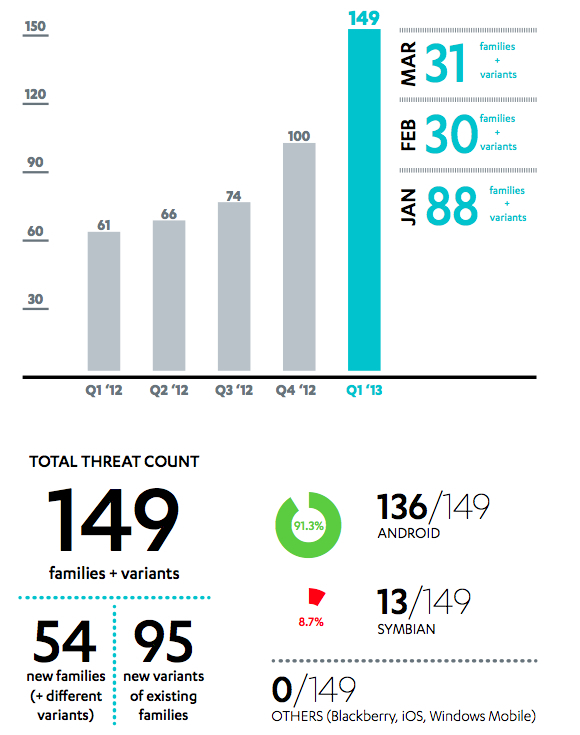 Lets take a look at F-secure’s mobile threat count for 2013 . A you can see the malware count is on a steady increase . The total number of malware and virus threats for phones have increased to 149 in the first quarter of 2013 , from just 100 in the end of 2013 . Out of which 143 ( 93% ) of malware and viruses are targeting Android phones and devices . Hackers mostly target the third world countries where people prefer cracked android apps and games instead of buying them . For a list of the latest android vulnerabilities take a look at this site . If you want to be safe from these android malwares and viruses here are some simple tips . Always install Android apps from the Google play store and the amazon app store and always avoid cracked android apps and games from other sources. There are many Alternative free apps and games for paid apps on the Android play store , Download them instead . Always check the reviews and ratings of apps before downloading them . On your android phone disable sideloading of apps . Go to your phone’s Settings > Security and make sure that the allow installation from “unknown sources” box is unchecked. Always update your phone to the latest version of Android . Update your android apps regularly. Install a good Anti virus from the Google play store . Avoid rooting a phone unless you are an advanced android user . Last but not the least . Support the developers who have work countless hours on their apps and price them as low as $0.99 a app . They do this to make these apps affordable to all . Dont get cracked android apps and games and advised your friends and relatives to do the same . Luckily in Android 4.2 Google disabled the ability of apps to send messages without the owners permission . But since most android devices don’t run the latest Android 4.2 many android users are still at risk from the Fakeinstaller virus . Virus threats are increasing rapidly and as we speak there are many phones getting infected . Do follow the above tips and let your freinds and relatives about these threat and always think twice before installing a cracked android app or game .